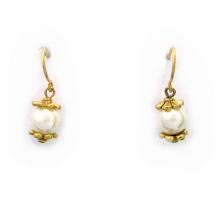 This graceful faux pearl jewelry is adapted from an opulent porcelain and gilt bronze jewel cabinet created in France and presented as a gift by King Charles X of France. Charming depictions of "ladies jewels" are the subject of several small porcelain plaques decorating the surface. This jewelry has been created in cooperation with the National Design Museum in New York.